Being injured in a motor vehicle accident means physical harm, financial detriment and the stress of addressing the multiple issues you face. If you have been injured in a motor vehicle accident involving a commercial vehicle or any other vehicle in The Bronx, the sooner you contact a Bronx motor vehicle accidents lawyer, the greater your chances of making a full financial recovery. 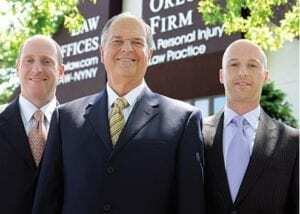 The Orlow Firm is a law firm experienced in helping victims of motor vehicle accidents recover maximum compensation for injuries, medical expenses, lost wages and other losses. We have represented clients in Brooklyn, the Bronx, Queens and Manhattan and throughout New York for more than 25 years. We work to see our clients restored after suffering the physical and financial losses of an auto accident. Contact our Bronx motor vehicle accident lawyers for a free consultation regarding your accident or injury.